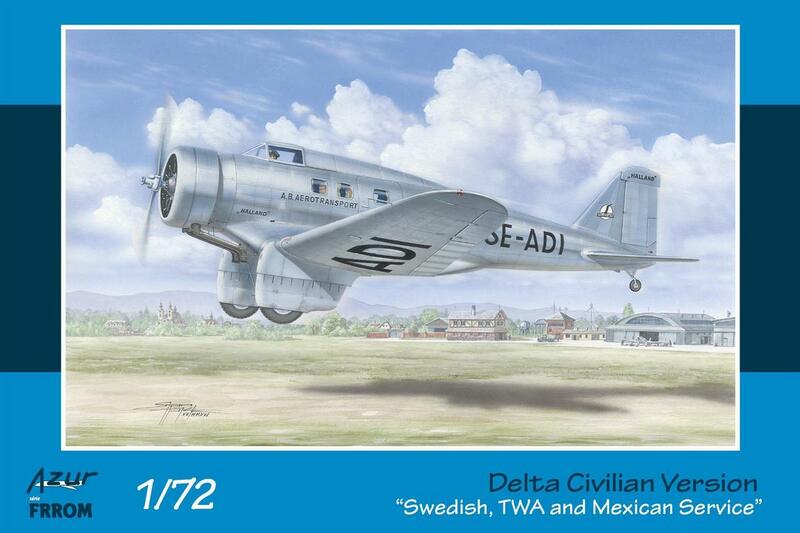 Delta Civilian Version "Swedish, TWA and Mexican Service" After just two years, Jack Northrop’s first company, the Avion Corporation, became a subsidiary of United Aircraft & Transport in 1929. His friend, Donald Douglas, then provided capital to found the Northrop Corporation in 1932, but by 1937 this became a Douglas Aircraft subsidiary known as the El Segundo Division. Jack Northrop then founded another company in 1939, also named Northrop, which in 1994 became Northrop-Grumman. Northrop worked independently as a pioneer of stressed skin metal aircraft construction during his time with the Northrop Corporation, creating two notable monoplane designs, the Northrop Gamma and Delta. The Gamma was developed as a mail plane whose production began in the winter of 1933-1934, whilst the 2E version served as bomber in China. The design was modified with a wider fuselage to become a transport capable of carrying eight passengers, then known as the Northrop Delta. The Delta prototype first flew in May 1933, and this was followed by a TWA order for 15 units. The Delta prototype (c/n 3), Type 1A, was equipped with a Wright SR-1820-F3 engine of 710 hp. After three months of testing, it obtained certification, but only to carry six passengers. Delivered to TWA for trials in August 4, 1933, it was used to transport mail between Los Angeles and Kansas City. After only 453 flight hours the plane had an engine fire and was lost on November 10, 1933, near Albuquerque, New Mexico, causing the pilot, Harlan Hull, to bail out. He would later become TWA’s Chief Test Pilot. The second Delta, (c/n 4), the Type 1B powered by a Pratt & Whitney Hornet T2D-1 of 660 hp, was purchased by the Pan American in August 1933, and transferred to its Mexican subsidiary Aerovias for use on the Los Angeles-Mexico City route. This plane, with Mexican registration X-ABED, was also soon written off after an engine fire that destroyed it on the ground in May 1934. The third Delta, (c/n 7), the only Type 1C built, had a much longer career than its predecessors. Equipped with a P & W T1D-1 engine of 700 hp, it was acquired in April 1934 by the Swedish company AB Aero, given the Swedish registration SE-ADI, was named "Hälland" and served on the Gothenburg-Copenhagen-Malmö and Malmö-Copenhagen-Hanover routes. In May 1937 the aircraft was removed from service and after several ownership changes was purchased by the Spanish Republic. It flew in the colours of LAPE, with Spanish registration EC-AGC. After the fall of the Republic it served in the Ejercito del Aire until 1945, coded as 43-18. These first three Deltas, built by Northrop (c/n 3, 4 & 7), used a two-bladed propeller, had a single-seat cockpit and a sliding canopy. Most of the later Deltas were fitted with three-bladed propellers, and all had two-seat cockpits. Type 1C Specifications: Low-wing single-engine transport with fixed landing gear, of metal construction. Engine P&W Hornet 700 hp. Wingspan 14.55 m, length 10.08 m, wing area 33.7 m2. Maximum speed: 362 km/h at 1,900 m. Ceiling 6,000 m. Documentation : Air Magazine n°24, February / March 2005 (in french) Decals for : Cam A : Northrop Delta 1C, c/n 7, SE-ADI, named Halland, A.B. Aerotransport airline, Sweden, April 1934 to May 1937. Served on routes Gothenburg-Copenhagen-Malmö and Malmö-Copenhagen-Hanover. Cam B : Northrop Delta 1A, c/n 3, X12292, TWA – Trans World Airlines, August to November 1933. Used as mail transport between Los Angeles and Kansas City. Cam C : Delta 1B c/n 4, X-ABED, Aerovias Centrales S.A. airline (a Mexican subsidiary of the PANAM air carrier), Mexico, August 1933 to May 1934. The airplane was used on the Los Angeles – Mexico City route.